I just finished reading an awesome book: Dude, You’re a Fag, by C.J. Pascoe. I’d heard of this book for a while (it was published in 2007), but didn’t know anything about it until recently. What in the world did the title mean, I wondered? Turns out that Pascoe spent a year and a half doing ethnography at a high school in California in order to “write a book about guys” (That’s how she described it to the students). Pascoe gained access to the high school by writing the school district office about her research topics and requesting access to the students. She was granted permission to come to the school and conduct interviews with students. So Pascoe made her intentions and motives clear before she began her ethnographic research. (Some ethnographers conceal their purposes as researchers and deceive the people they’re studying--generally because they don’t want people in a setting to alter their usual behavior by virtue of being watched). Recently my internet access went down. Not five minutes before, I had been on the phone with a billing representative who told me I could save a few dollars a month if I bundled my internet with another service. So I agreed, thinking I just did a good thing. When I couldn’t get on the internet—which I needed to access for the work I had been doing before I took a break to make that phone call—I was furious. Why didn’t the rep tell me that changing the billing might affect my service? I had called their technical support line before, and I knew I was in for a long hold time before reaching an overseas call center. Although the rep spoke English well, there were some things he didn’t understand, such as how to track a shipment (which contained my then-missing modem). How should you choose your dissertation topic? Be pragmatic: you’re going to spend a lot of time working on this topic, becoming an expert on it, so make it something that really holds your interest. Sure, your plan is to crank out your dissertation in two months. And maybe you will do just that, but just in case you’re mortal like the rest of us and need a few more months (or years) to do so, you’ll want to make sure you can stand to think about your topic during that whole time. Discussions on our campus lately have focused on the state budget cuts and how those affect us and our students. Each semester, as each round of cuts occurs, we have fewer and fewer spots for students to attend our classes at a time when demand is growing. We’re a community college, so we are getting people from the universities and colleges who can’t get into classes there. We also have people who are trying to start college and those who are trying to retrain for new occupations. We have closely examined our costs, instituted hiring freezes and slashed supplies budgets, and we still have to cut out more classes to balance our budget. In recent discussions, we debated not printing our schedule of classes and moving all of that information solely online. It’s already online, but we have still printed paper copies that are available on campus. Many universities have made their catalogs and schedules online-only and we’d save a fair amount of money if we do so too. Many other community colleges are considering this and some have already stopped printing such information. Sociologically, what are the pros and cons of making schedules and catalogs available only online? Ecologically, it makes a lot of sense since these schedules are only useful to most people for a semester or so. A lot of paper and ink would be saved. Because of our budget cuts, though, more students each semester have to run around campus to attend first classes to see if there is room to add. They do not often have much success, but they try anyway. The paper schedules come in handy for both faculty and students since we can leaf through it to see what other classes are available and where they are held. Students who have smart phones or other web devices can check the online listings or the online list of open classes. Students without such devices would be out of luck if no paper schedules were available, though. They would have to keep running back to the building that posts lists of open classes (if we keep printing those out and posting them). Moving registration online is more efficient than previous enrollment strategies. However, the process of finding classes is facilitated by having easy access to a listing that doesn’t run out of battery power or is available only on a website that might crash or have access issues. My bigger concerns about losing access to an officially printed paper schedule is that students who are not web savvy might lose access to entering and navigating college. As a community college, not all of our students are “transfer ready” or even destined to go to a university where it’s necessary to have Internet access and a personal computer. We serve many different functions, but a big part of our mission is open access to those who want an education. The budget cuts make it impossible to meet this objective since we have to turn students away. Because registration often prioritizes those who have more units for early enrollments, by the time new students can register, classes are all full. It is those new students who have less knowledge about to how to navigate college processes. If these were all people from the upper income and social class level of society, they could easily use web pages to figure it all out. However, the population of community colleges includes people from all walks of life and all social class levels. The “Digital Divide” refers to a gap in access to technology that is certainly structured by social class. The Pew Research Center did a recent study clearly showing that upper income people have more access to technology than those in lower income levels. Clearly, there are people using technology at all income levels but the usage and access is much more at the higher levels. Based on this graph, it appears that of those who earn less than $30,000, 25% might not own a cell phone and 43% might not even use the internet. This research, coupled with the idea that community colleges are moving towards putting all of their enrollment information online, suggests that our current educational model of open doors and access for all those who want an education is no longer valid. With the economic issues plaguing states and the nation, our educational system is suffering with fewer and fewer people able to educate themselves. Using technology to save money adversely affects people in the lower income levels who may not have easy access to the Internet. What does this mean for our society in coming years? What will it mean to any potential economic recovery when a large portion of the population is denied access to education? Births to teens fell as well. Despite fears of a “pregnancy pact” in 2008, or that movies like Juno (2007) and shows like 16 and Pregnant and Teen Mom (2009-present) would inspire teens to get pregnant, we have seen declines in teen pregnancies, as the graph below details. In fact, the teen birth rate is the lowest it has been in American history, at 39.1 per thousand in 2009. In contrast, in 1957 the teen birth rate was 96.3 per thousand. Most of the teenage mothers are 18-19-year-olds. In fact, a few years ago when teen birth rates rose after years of decline (see the slight bump around 2005 in the graph above), much of that rise was in the older teen group. In fact, the only age group that has exhibited increases in fertility are women over 40. While the birth rate for women 40-49 was lower than any age group in 2009 except for 10-14 year-olds, the birth rate for 40-44 year-olds increased 6 percent from 2007, and births to women 45-49 years old—a group the CDC had traditionally not counted in fertility rates—increased seventeen percent during this time. What might explain these trends? Many personal factors play a role in whether or not someone gets pregnant. In fact, we might argue that this is one of the most intimate aspects of our lives. But there are important sociological issues that influence when and why babies are born. One of the most important has to do with economic realities. When reporting on this trend, many news stories, like this one from CNN, highlighted the role the recession may have played in lowering the birth rate. But what about the upward trend in births to women over 40? Aren’t they impacted by the recession too? Ironically, it may be the financial stability of women over 40 that partly explains this trend. Advances in fertility medicine are likely helping many of these births, but these treatments can cost thousands of dollars. Having had the opportunity to advance within the labor force, this age group likely has resources available that younger women do not. According to the Bureau of Labor Statistics (BLS), in March 2011, the unemployment rate for women aged 40-44 was 6.5 percent, compared with 7.6 percent for women 35-39, 8.7 percent for women 25-34, and 12.7 percent for women 20-24. In her book Ready: Why Women are Embracing the New Later Motherhood, Women’s Studies scholar Elizabeth Gregory interviewed 113 mothers aged 35 and older, finding that many of her respondents report having stable careers and marriages, making childrearing more attractive. 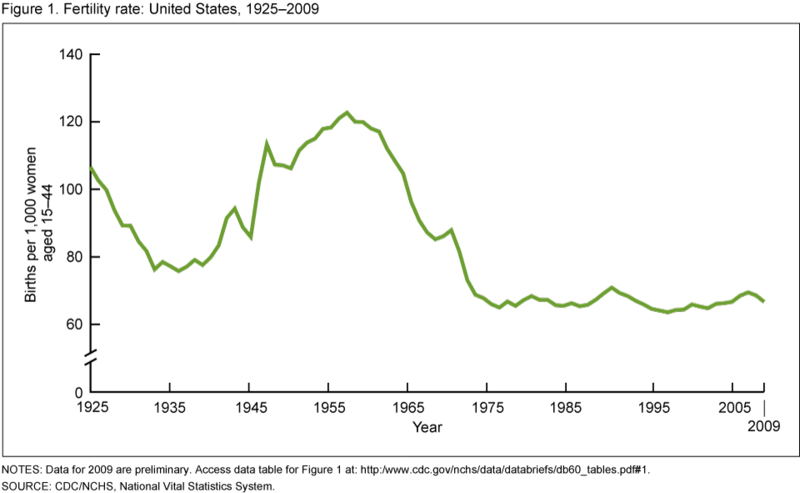 As you can see from the graph below, there have been several dips in the fertility rate throughout history. Fertility rates fell during the 1920s, a time when the economy overall was strong and unemployment low. This was also a time when activists like Margaret Sanger promoted contraception and family planning, and the women's suffrage movement successfully lobbied for the right to vote in a push for greater equality. 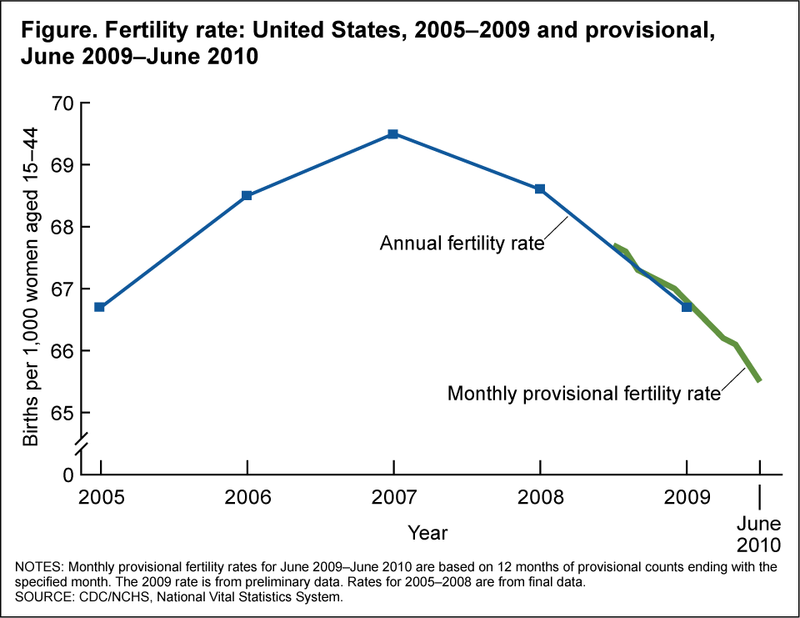 Declines in fertility during this time might also be linked with growing urbanization, when more Americans lived in cities than in rural farming communities where having many children is economically necessary. The start of the Great Depression and entry into World War II likely influenced the plateau we see in birth rates in the 1930s and 40s. Following the war, economic growth made it easier for couples to marry early and afford children. The midcentury baby boom ended in the mid-1960s, and American fertility rates have remained lower ever since. What economic and sociological factors do you think help explain the relatively low birth rates over the past 40 years? What is your favorite marriage proposal story? For me the answer is easy: my own! That may not be true for all married couples I suppose, but it is for me. I thought about my proposal when I saw the television show Mobbed for the first time, last week. Executive produced and hosted by the hyperactive comedian, Howie Mandel, the show produces flash mobs for personal occasions. Want to propose? A flash mob will help you do that. Want to let your honey know that you’re pregnant? A flash mob can help with that announcement too. Not very long ago, I didn’t even know what a flash mob was! One of the first ones I recall was the season opener of The Oprah Winfrey Show that featured a performance by the Black Eyed Peas. Mobbed was also rather instructive in helping me understand how so many strangers could be unified by the same dance moves as they converge on one public space. On the episode of Mobbed that I saw a young man used a flash mob help to propose to his girlfriend. The highly orchestrated proposal was not enough for the over-zealous Mandel, who thought they should go further with the surprise by having the couple get married on the show. Some of the episode centered on showing the audience how the production plans came together. We saw potential mob participants arrive in the parking lot of the California mall that hosted the extravaganza. There, they checked in with organizers and rehearsed their dance moves. We saw the prospective groom, his brother, and some friends learn their own dance moves. In this production of Mobbed, an actress played an old flame, who upon meeting the couple out for a pretend movie screening, becomes irate enough to throw a glass of water into the man’s face. This heightened the drama, particularly since the girlfriend tended to be jealous, and it gave the man an excuse to leave the table to change into formal attire. Immediately, the first of the flash mobsters sprung into action. A “security guard” appeared to quell the disturbance began to sing “Everlasting Love” as the ”patrons” and ”waiters” danced and stepped. The bewildered young woman was then led outside where the fairy tale continued to unfold with more singing and dancing, culminating in the boyfriend’s dance number and proposal! Then he requested that they marry right there. The shaking woman was put into a wedding gown on the spot—her colored blouse peeking under and the back unbuttoned. The show had flown in the brides’ friends and parents, and of course, there was someone to perform the ceremony which was witnessed by the flash mobsters. I was caught up in the emotion of the show. The fairy-tale happy ending quality was seductive, and I found myself rooting for this couple I have never met. Wasik talked about those who join flash mobs as conforming to the pressure to do so. This example of the show Mobbed, may also illustrate the need we have to conform in certain situations. As we know from the Asch experiment, groups can exert enormous influence on us. With a final count of 1,017—plus who knows how many other onlookers—how likely was the woman to refuse her boyfriend’s proposal? And what about his request that they marry right away? Could she say no? The huge earthquake that hit northern Japan and the tsunami that followed it twenty minutes later created a terrible tragedy in that country. The loss of life added to the loss of property and communities creates a situation hard to imagine for those of us watching from a distance, particularly with additional concerns about a nuclear disaster and the spread of radiation. Perrow coined the term to signify the inevitable situation that occurs when a tightly coupled and interactively complex system breaks down. “Tightly coupled” refers to a system in which the parts are highly interdependent, they have major impacts on each other when change occurs and those impacts happen quickly. “Interactive complexity” refers to complicated systems in which processes lead to yet other processes, many of which may be unidentified and unplanned. The example he uses is primarily of the “high-risk technology” of nuclear plants. The many cases of normal accidents he recounts typically involve not only technological breakdowns but also operator error that exacerbates the problems. Many organizations that use high-risk technologies have paid attention to Perrow’s work and the concept of “normal accident” so that they may perhaps design in some added safeguards against them. NASA is one such organization. While it remains to be seen how the nuclear plant situation in Japan will resolve, let’s see if what has happened in the first few days can be explained by Perrow’s theory. The problem began when the earthquake shut down the active reactors at the plant. (Three of the six had been shut down for maintenance.) Flooding from the tsunami wiped out the generators that kept the cooling pumps running. This situation resulted in the core melting down in three reactors with explosions and fires damaging the housing and other internal equipment. Continuing explosions within the chambers prompted evacuations of workers and there have been some evidence of radiation leaks in the surrounding areas. After nine days, power was restored and repairs began. Radiation contaminated food grown in farms surrounding the area and traces of radioactive iodine were found in Tokyo’s water supply. Does this fit the model of a “normal accident” even though the earthquake and tsunami were certainly not “normal” events? Nuclear power plants are tightly coupled systems in which each process is linked to another as seen when the cooling pumps failed, a chain reaction of events resulted in fires, explosions, and radiation leaks. So we have interactive complexity. Although workers attempted to fix the systems, the chain reactions of failures happened quickly and at times unexpectedly from what we’ve seen reported. We’ll need more information to see if operator error was involved, although part of the theory of “normal accidents” suggests that no human operator could possibly keep up with the accident chain of events since they happen so quickly and so unexpectedly. At this level, operator error isn’t an opportunity to blame the workers for the problem or lack of solution; it’s simply part of the complex puzzle that makes such a high tech system. Perrow’s theory highlights the normality of accidents when we have such high-risk technologies. That accidents will happen is a given. What we do in response to knowing this will happen becomes important. Interestingly, a number of countries have decided to close or scale down their own nuclear power plants as a response to this event. This is interesting considering they didn’t make such a decision after the accident at Three Mile Island in Pennsylvania in 1979 or even after the Chernobyl disaster in 1986. The previous two events had operator errors involved that contributed to the events, while this one was prompted solely by a natural event and we’ve yet to hear about any operator errors. We may realize that we have trouble designing out natural events such as earthquakes. However, we continue to think we can design out operator error even though Perrow’s theory suggests otherwise. It’s amazing to reflect on the technology I’ve encountered in my lifetime. I think back to my childhood when I’d go with friends to the mall arcade and play Galaga and Pac-Man. Most of my friends and I owned Atari back then. We’d play Frogger and Donkey Kong for hours on end. By the time I was in middle school I had a 13-inch TV and a phone in my bedroom. So I had my own space to watch TV and call girls. But privacy was limited in those days: if anyone else in the house wanted to make a call, they’d pick up another phone and suddenly interrupt the conversation. My parents and brother shared the phone line, so someone usually had to wait to use the phone. It was an exercise in patience, and communication with peers was neither immediate nor constant. The 13-inch TV worked long enough for me to bring it to college in 1990. I remember watching Cheers in my dorm room and the early years of The Simpsons in the recreation room with other freshmen. My freshmen year in college was the first time I wrote a paper using a computer. It was also the year I began using e-mail, mostly to send notes to my new girlfriend. I kept in touch with people from high school by writing letters and postcards. It was a way of saving money because most phone calls then cost extra for being “long distance.” It wasn’t until my sophomore year in college that I bought my first compact disc--so long, cassette tapes! Grunge and hip-hop were the music of the day. Pearl Jam, Nirvana, Dr. Dre, and Snoop Dogg were favorites on campus and in bars. None of us had cell phones, so social life was usually unplanned. Although I could reasonably guess where I could find my friends if I wanted to meet them, there was no way of being sure where people were hanging out. Plans you made earlier in the day often changed. So a lot of times you just showed up at a house party or bar and hoped to see familiar faces. I got my first computer in 1995 and brought it with me to graduate school. I began using the Internet on a regular basis, but the web was only a baby then. I have no recollection of favorite websites in those days, and surfing the web took forever because there weren’t high speed connections. By the time the 1990s ended, I still didn’t have a cell phone. Fast forward to 2011. It’s hard for me to grasp all the technology we have in the 21st century. Aside from television, Facebook is probably the most powerful technological force in my lifetime. It’s incredible to me that people document their lives on Facebook. I watch in amazement from a distance; I still don’t have a Facebook page. I have enough distractions in my life (television being at the top of the list) so I’ve avoided Facebook. But I definitely understand its appeal. Facebook seems to be proof that we truly are social beings. We thrive on being connected to others and being part of a crowd. People can’t wait to share their latest picture or status update. Whenever my wife tells me to look at something interesting on her Facebook page, I see my peers posting pictures of their children and offering every little detail of their lives. Facebook really has blurred the line between front-stage and back-stage. And Facebook has already secured an important part in history, especially if we consider the part it played in the recent uprising in Egypt. An Egyptian family even named their baby Facebook in recognition of the site’s role in the protests. We also have the bizarre world of Twitter. I’m not sure what to make of Twitter, but if I had to explain it to someone from another planet, I guess I’d say celebrities seem to love it and everybody (famous or otherwise) has a chance to broadcast their thoughts or whereabouts in 140 characters or less. I use Twitter to post links to songs that I like (or old pop songs that amuse me, like this one) and to try to say something clever once in a while. On a daily basis I take advantage of technological luxuries like a flat screen television, a cell phone, the netbook I used to produce this blog, and satellite radio. I can’t remember the last time I bought a newspaper; I read my news online. I don’t spend a lot of time in bookstores because almost any book I could ever want is available at Amazon.com. Instead of going to record stores, I use iTunes. I used to go to Blockbuster to rent videos; now I get them through Netflix. I often think about what’s coming next with regard to technology. What are the future forms of communication? How will technology continue to change the ways we interact? How will it influence what we consume? How will it influence our work? What will be the next Facebook? The next YouTube? What comes after Skype? What will replace text messaging? How big can televisions get, anyway? How small can computers get? How fast can they make the Internet? Most of us have no clue about the answers to these questions, but anyone reading this blog surely is impacted by technology. How is technology a force in your life? Do you always embrace it or try to limit its power? Finally, how do you imagine it will change in your lifetime?